PolicyTech is a policy and procedure management software developed by Navex Global. It is a platform designed to further enhance efficiency within organizations by providing employees with fast and immediate access to all the policies and procedures that they need. This software is implement by thousands of organizations and enterprises across multiple industries, including Healthcare, financial, life sciences and industrial manufacturing, to help them effortlessly implement auditing, generate reports, ensure documents are up-to-date and manage and mitigate risks across the entire organization. PolicyTech enables companies and organizations to fully focus on the quality of their policies and procedures instead of managing them. This has resulted in better approval and publication of better policies, enhanced productivity, and strict compliance with industry standards. PolicyTech helps you ensure that your employees have instant and unhindered access to your company’s policies and procedure with a mobile-optimized design. From their smartphone or tablet, your employees can easily search and browse for policies and procedures that are critical to their work, roles, and department. And since they can access important policies and procedures using their mobile phones, that means they can get them from anywhere at anytime. PolicyTech also makes it easy for company management to create, edit, and review localized versions of policies and link them all to the master document. Once a policy is approved and finalized the software helps you deliver the updates directly to your employees with attestation monitoring. As PolicyTech automatically delivers new and updated policies and procedures to employees, the software also comes with features that test employees’ understanding of these changes such as comprehension quizzes. Whenever audit time comes, PolicyTech is there to make sure that your organization is primed and ready. The software’s version control feature with automatic archiving ensures that each version is stored and documented, complete with signatures. This results in very thorough reporting and support for audits. There will be times an employee violates company policies and procedures. PolicyTech helps you achieve better visibility into these violations by providing employees with a report form with which they can submit a violation report directly to your incident management system. 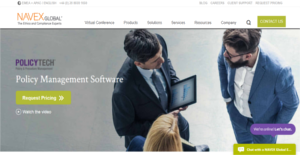 If you are considering PolicyTech it might also be beneficial to check out other subcategories of Best Business Process Management Software listed in our base of SaaS software reviews. It is important to keep in mind that almost no service in the Business Process Management Software category is an ideal solution able to match all the goals of different business types, sizes and industries. It may be a good idea to read a few PolicyTech reviews first as specific solutions may dominate only in a really small group of applications or be designed with a very specific type of industry in mind. Others may operate with an idea of being easy and intuitive and consequently lack complicated elements needed by more experienced users. You can also find solutions that support a large group of customers and provide a complex feature set, however that in most cases comes at a more expensive price of such a service. Make sure you're aware of your requirements so that you buy a service that provides all the elements you search for. How Much Does PolicyTech Cost? Contact Navex Global for enterprise pricing information and other product details on PolicyTech. We realize that when you make a decision to buy Business Process Management Software it’s important not only to see how experts evaluate it in their reviews, but also to find out if the real people and companies that buy it are actually satisfied with the product. That’s why we’ve created our behavior-based Customer Satisfaction Algorithm™ that gathers customer reviews, comments and PolicyTech reviews across a wide range of social media sites. The data is then presented in an easy to digest form showing how many people had positive and negative experience with PolicyTech. With that information at hand you should be equipped to make an informed buying decision that you won’t regret. What are PolicyTech pricing details? What integrations are available for PolicyTech? If you need more information about PolicyTech or you simply have a question let us know what you need and we’ll forward your request directly to the vendor.